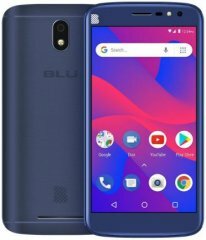 A spinoff of the BLU C6 that comes with almost exactly the same pros and cons, save for some noticeable differences physique-wise, the 2019 BLU C6L's entry-level specs include a mundane 1.4GHz quad-core processor coupled with an ungenerous 1GB-only RAM . Given those low-key hardware components, though, BLU made the right choice by infusing this model with the Android 8.1 Oreo Go Edition OS , plugging it into Phonerated's list of budget-friendly Android Go smartphones. Android Go, by the way, is essentially a stripped-down version of the Android ecosystem consisting of re-imagined essential applications dedicated to conserving phone storage and mobile data allocation as well as augmenting the phone's overall performance. 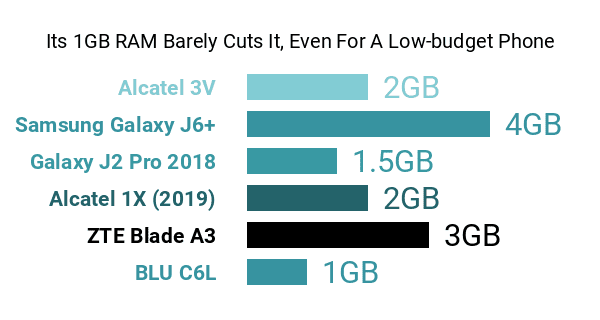 Going back to its cons, the C6L is significantly heavier than a lot of its dual-SIM rivals, at 203 grams -- many tantamount models weigh only about 150g. Its 5.5-inch HD-720p 267ppi display is far from impressive as well, although some of its BLU cousins offer lower-resolution 540p (qHD) and 480p (FWVGA) displays. As for its pros, despite sticking to a run-of-the-mill 5-megapixel front-facing camera resolution , the C6L's front-firing LED flash might attract some budget-cautious selfie addicts, especially since not a lot of low-enders offered flash-rigged selfie cams around the time of this data-driven review. On the other hand, its 8-megapixel primary camera, which comes with its own LED flash and captures Full HD videos (1920 x 1080), sounds just about right, at least for a phone within the C6L's price group. The C6L is loaded with 16GB of native memory expandable by up to 64GB, while a modest 2500mAh battery powers its low-caliber mix of pros and cons. It comes with standard 4G-LTE network compatibility. Available in Blue, Gold, and Black, this entry-level BLU model targets first-time Android users or those looking for an inexpensive essentials-only smartphone.